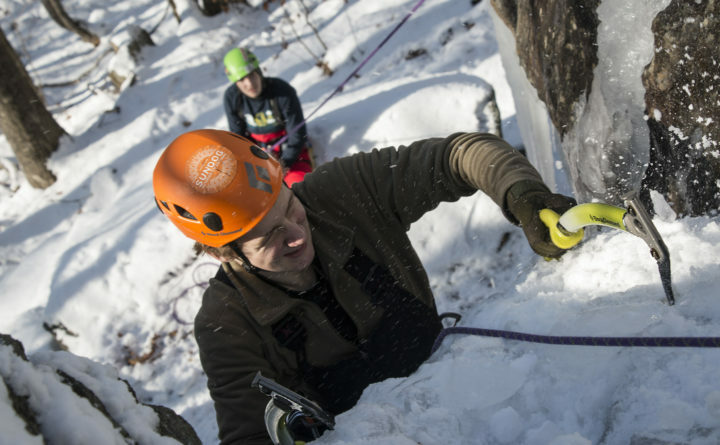 Noah Rousseau, 14, of Appleton finds purchase with an ice ax while learning to ice climb with Equinox Guiding Service on Dec. 20, in Camden Hills State Park. The ice loomed ahead in frozen waterfalls, bumpy mounds, rippling walls and tapered icicles. As the water ran over the cliffs and down the steep slope, it solidified into wild shapes that could only be conquered with ice axes, spiked boots and a sturdy rope. “You want to find the best spot for the ice ax to go in,” Noah Kleiner said as he brushed crusty snow away to reveal the smooth surface of the wall. 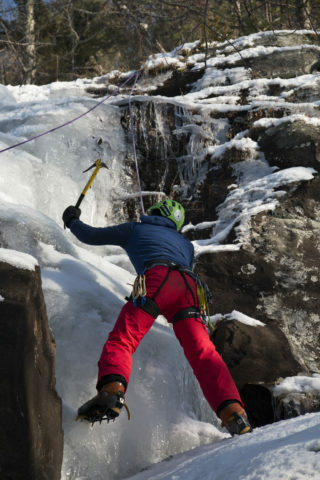 It was a sunny morning in December, and Kleiner, co-owner of Equinox Guiding Service in Camden, was teaching two young men how to ice climb for the first time. They listened and watched attentively as Kleiner described the intricacies of ice and the techniques that make ice climbing a sport that is not as difficult or scary is it might seem. 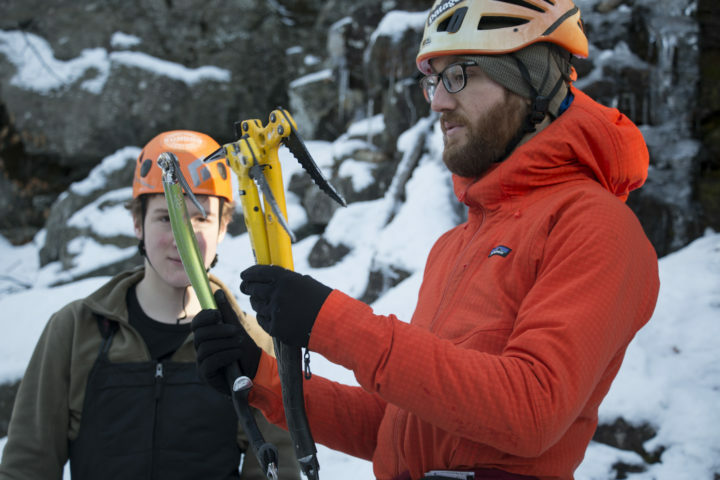 Noah Kleiner (right), owner of Equinox Guiding Service, talks to his clients about the difference between ice axes on Dec. 20, while teaching them to ice climb in Camden Hills State Park. Swinging his ax in a smooth arc, Kleiner buried the tool’s sharp, pointed end into the ice with a deep thud. The handle of the ax — also known as an ice hammer — quivered in his gloved hand, indicating that the placement was solid. “That’s really in there,” he said, kicking his spiked boots into the wall and tugging on the ax with both hands. It didn’t budge. Only when he pulled the ax upward did it release from the ice so he could swing it once more, higher on the wall. And up he went. Noah Rousseau, 13, of Appleton smiles while halfway up an ice route in Camden Hills State Park on Dec. 20, while learning to ice climb with Equinox Guiding Service. 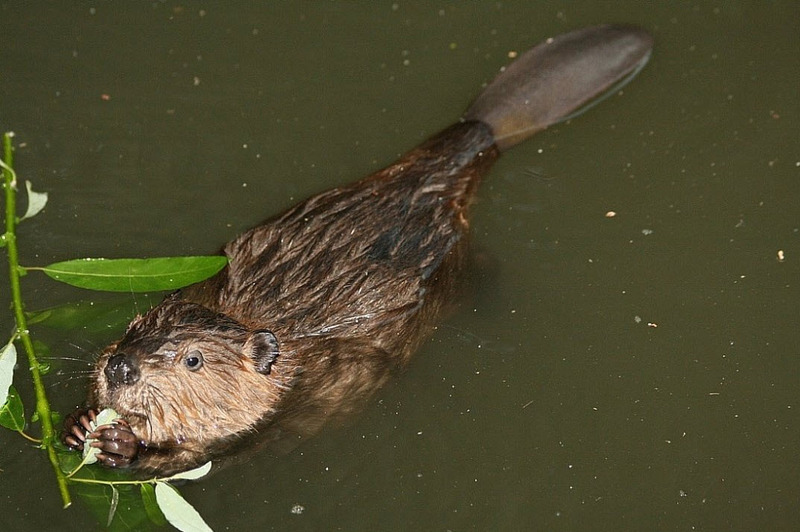 Established less than three years ago, Equinox Guiding Service is owned and operated by Kleiner and John Sidik, who both grew up in the Camden area and have diverse backgrounds in outdoor education and guiding. 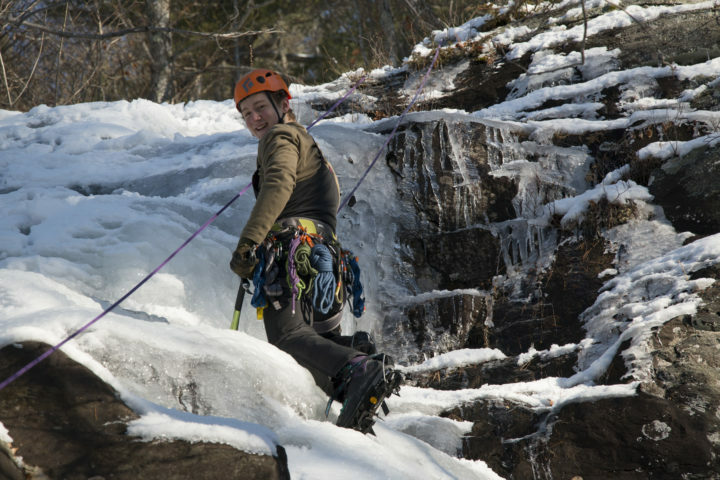 At first, the small business offered only rock climbing instruction and trips, but this winter, they are branching out to offer ice climbing in Camden Hills, Acadia National Park and beyond. Jack Main, 15, of Camden scales a wall of ice on Dec. 20, in Camden Hills State Park while learning to ice climb with Equinox Guiding Service. That day, his clients were Noah Rousseau, 14, of Appleton and Jack Main, 15, of Camden, who had both gone rock climbing with him before — but not ice climbing. And while the two sports have some similarities, they are actually quite different. In rock climbing, you search a rock wall for cracks and shelves to grasp with your hands and feet, while in ice climbing, you’re reading ice and creating your own holds, wherever you want, with the sharp end of an ice ax and the metal spikes of crampons fastened to your boots. Rousseau also enjoyed his time scaling the ice that day. 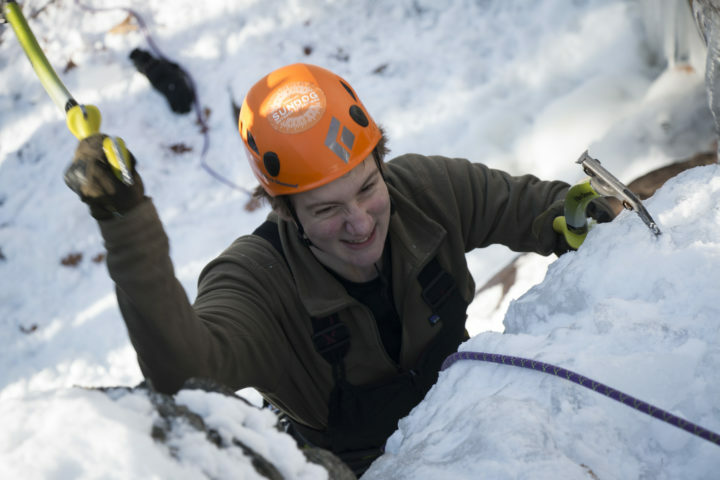 Noah Kleiner, owner of Equinox Guiding Service, demonstrates a wide stance while teaching beginners how to ice climb on Dec. 20 in Camden Hills State Park. 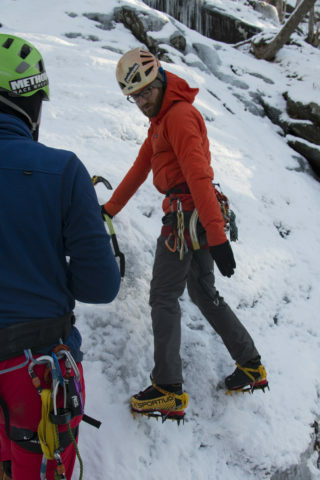 Kleiner started climbing in 2006 and went on to become a licensed Maine Guide and Single Pitch Instructor, as well as an Aspirant Mountain Guide. He has worked as a guide at Atlantic Climbing School, as well as an outdoor instructor for the 4-H Camp and Learning Center at Tanglewood and Chewonki. Sidik is also a Single Pitch Instructor, as well as a certified instructor for the American Institute for Avalanche Research and Education. He also studied professional ski and snowboard guiding at Colorado Mountain College, and has guided for Acadia Mountain Guides. Together, Kleiner said, they make a great team. The biggest barrier to ice climbing is a mental one, Kleiner said. People often doubt their own abilities, and he thinks some of that stems from popular climbing films that show the more extreme, challenging and dangerous aspects of the sport, where climbers attempt to scale giant vertical walls in remote locations. But this isn’t the experience you’re signing up for with Equinox Guiding Service. First of all, in many ice climbing films, climbers are “lead climbing,” which means they are climbing without a rope above them to catch them if they slip. Instead, they carry a rope with them and fasten it to anchors they create along the way, usually with ice screws. This means, if they fall, they’ll fall down to the last anchor they created — which can cause serious injury, especially because they’re holding sharp tools and have spikes on their feet that can easily catch on the wall on the way down. Jack Main, 15, of Camden works his way over the lip of a wall of ice up Dec. 20 in Camden Hills State Park while learning to ice climb with Equinox Guiding Service. In contrast, clients of Equinox always climb with a rope fastened to an anchor at the top of the wall so that if they slip, they won’t actually fall. The rope, which is constantly being cinched by the instructor, will catch the climber instantly. This anchor at the top of the ice wall is set by the guide, who usually must lead climb to the top of the wall to place it there, unless there is a way to hike up. “Half of my job is managing the risk and making it as safe as possible,” Kleiner said. The other half is making sure his clients have fun. Jack Main, 15, of Camden works his way up a wall of ice in Camden Hills State Park on Dec. 20. With Camden as their home base, Equinox guides trips to a variety of ice walls, with beginners starting with easy, short routes that are more like ice hills than ice walls. In the Camden Hills alone, there are about five locations that they frequent, and each has multiple ice routes, with names like Everdrip and Neverdrip, Double Clutch, Dragon’s Tooth and Hot Spot. 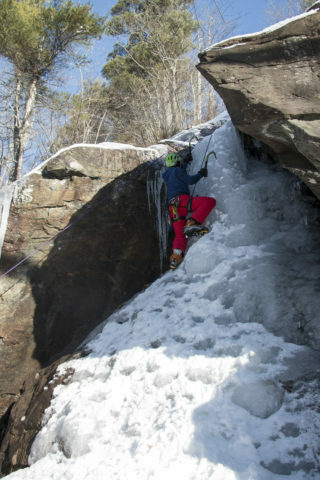 While Kleiner is confident he can teach beginners how to ice climb on many of these routes, he stresses that ice climbing isn’t a sport for people to just pick up one day and try without proper guidance. Like rock climbing, ice climbing requires special knowledge of important safety gear, including ropes, anchors, harnesses and belay devices. Also, using proper techniques makes all the difference, and it doesn’t come naturally. For example, Kleiner suggests to swing your ice axes far less than you kick your ice cleats into the wall. “Think of one swing for every four steps,” he said. 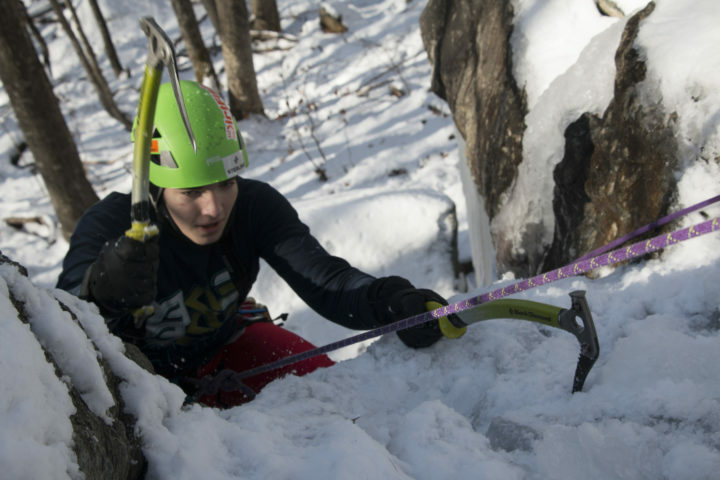 Noah Rousseau, 14, of Appleton swings an ice ax to gain purchase while learning to ice climb with Equinox Guiding Service on Dec. 20 in Camden Hills State Park. For Rousseau and Main, Kleiner selected ice routes on a flowage at the base of Megunticook Mountain known as North Cataract. That day, the temperature warmed into the 40s. That night it rained. And the next day, the ice wall was gone. Then, a few days later, when the temperature cooled once more, it started to reform. That’s just one of the many intricacies of the sport, and Kleiner is hopeful that this will encourage climbers like Rosseau and Main to return and develop their skills. If they do, he and Sidik are ready for them.